Here you will find the resources you need to publish stories about SimplyUnite Gem. For information about SimplyUnite Connect please contact us on 0845 388 4461. The photographs shown here are in low resolution. Please call 0845 388 4461 for high resolution versions suitable for publication. Photos can only be used by permission of SimplyUnite. Left to right: Patricia, 84 and Brenda, 89, with senior carer, Jomar, at Torkington House, Acton, London, using SimplyUnite's Gem system. Left to right: Cyril, 80, and 81 year-old Larry using SimplyUnite's Gem with senior carer, Jomar, at Torkington House, Acton, London. 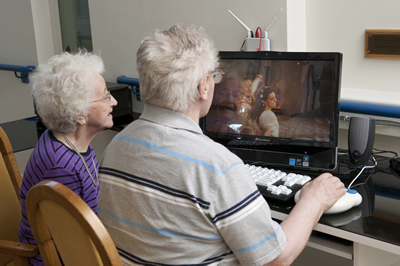 Left to right: 89 years-old Brenda and Cyril, 80, watch a movie on the SimplyUnite Gem at Torkington House, Acton, London. 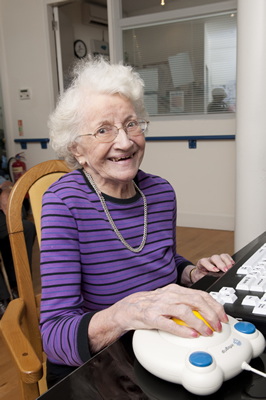 89 years-old Brenda, a resident at Torkington House, Acton, London, using SimplyUnite's Gem. 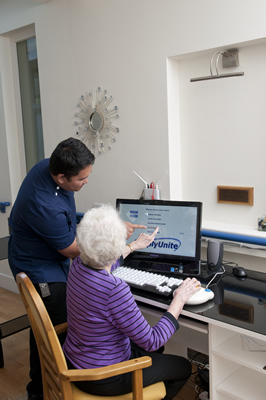 Jomar, senior carer, helps resident Brenda, 89, to use SimplyUnite's Gem at Torkington House, Acton, London. Margaret, Manager at Torkington House and Jomar, Senior Carer, using SimplyUnite Gem for staff development. Regina, member of care staff at Torkington House, Acton, helps Jackie, left, a relative of one of the residents, use SimplyUnite. 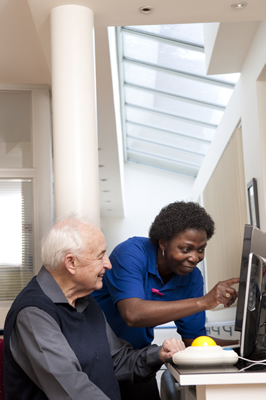 William, 80, a resident at Torkington House, Acton, London, with Pappoe, a member of the care staff. Rosemary, 78, a resident at Torkington House, in London's Acton, receives advice from Jomar, the home's senior carer. 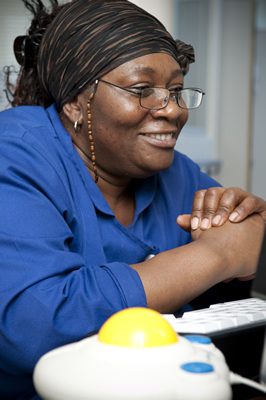 Florence, a member of staff at Torkington House, Acton, uses SimplyUnite Gem for staff development. These case studies have been brought together to provide real life examples of the beneficial impact of using SimplyUnite Gem. All personal details have been removed to protect privacy. If you would like to write an article and use these stories, but need more information please call 0845 388 4461. Resident, 86, is living in a home in Lincolnshire. Her daughters live in the UK but other family members live in Italy and in Australia. Her daughter helps her mother keep in touch with regular emails. They also receive photographs. As there is a family wedding coming up in Australia, the resident is cheered because she knows she will be able to receive all the pictures. A resident, age 79 and living in a home in Shropshire, receives music and photos from her son-in-law. He has helped her set up an online album, including a photo of him and his wife, meeting the Queen. He also helps the resident keep in touch with her sister in Canada. The sister made a visit recently and she was able to email about the arrangements in advance and, when her sister went on to visit places in Europe, receive regular bulletins of her journey. A resident, age 102 and living in a care home in Shropshire, was visited by a Canadian friend just after the Gem was installed. She was able to view her friend's home via the internet. A care home in Dorset has 21 residents, nine of whom regularly use the service. The first to sign up was a lady of 86, who receives emails and photos from her family. The care home manager helps each resident and is very fluent about SimplyUnite Gem and the beneficial impact on her residents. A resident of 92, living in a home in Liverpool, uses Gem to do her clothes shopping. She researches the clothes catalogue sites, picks out what she wants and staff help her to buy the items she likes. The resident's husband was a navigator in the Dambusters, and was thrilled when the home brought the film onto the big screen for her to watch. She has family in Shropshire who visit but she loves seeing her daughter-in-law via Skype in between visits. The home has used Google Earth with a lot of their residents. The resident has been able to see where her grandson lives in the US and follow where he has been working in Canada. Other residents have revisited their home cities/areas using Google. The home had a Royal Wedding party. A resident's daughter-in-law was able to share the experience and see the buffet table via Skype. The home has asked SimplyUnite to put the pictures of the event on the big screen. One resident with dementia blossomed at seeing her old home area in Yorkshire, accurately predicting where various sites (the town hall, the best fish & chip shop) could be located. Another resident with dementia, often agitated and walking around had significant periods of calm while engaged with activities on screen.